I may have been walking with a rather distinct hobble for a few days, but it was entirely worth it. 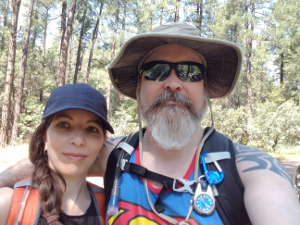 Heather and I went hiking on the Horton Creek Trail for our anniversary, and it felt great to get back among the trees, even for just that day. If you’re familiar with this trail (and if you’re not, and you’re in this area, I would strongly suggest that you correct this oversight), you probably already know that it is officially listed as “easy (moderate toward the end)” on the hiking websites, but I am almost 45-years-old, haven’t been hiking in years, and am woefully out of shape. I thought it became moderate rather earlier than the descriptions promised, and, by the end, my single walking stick could have certainly used a friend. I saw men riding bicycles along the trail. I saw women carrying newborn babies in fancy baby-backpacks. I saw a few silver-haired elderly couples. I came to realize that “woefully out of shape” may not be a large enough description. I think there might be pandas in better physical condition than I am at the moment. Something I should probably address. None of that should be understood as a complaint of any kind, except perhaps at myself. We had a great time, and have every intention of doing it again. In fact, I had to explain to Heather that every weekend might be pushing things just a bit. I’m not sure I could survive that just now, though going more often will certainly help to address my shortcomings in that department. 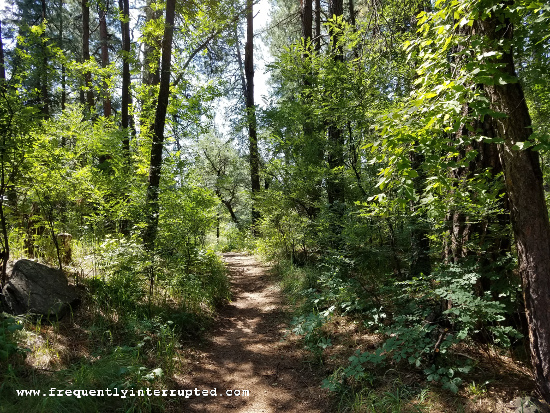 It would be good for me to get out on the trails frequently, both physically and mentally. The physical part is obvious, right? Walking is good for you, and hiking is just walking with nature. If you’re doing it right, hiking involves fresh air, adjustable inclines for different levels of resistance, and pushing yourself sometimes past what you might believe you can do. 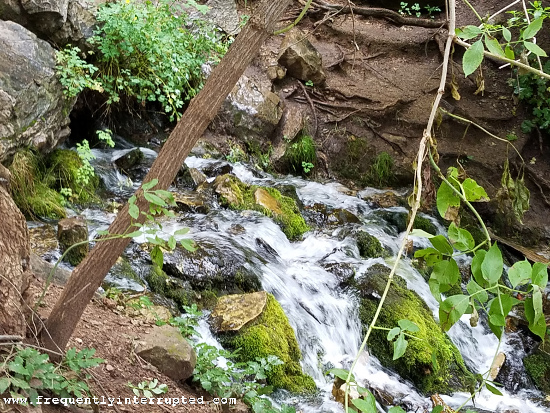 The particular hike that we took is eight miles long, four miles in to get to a scenic spring bubbling out of the side of the mountain, and then four miles back out. As far as I could tell, there is no shortcut. At one point, I did look, but that was just self-doubt and not really need. It clearly wasn’t need, since we did complete the hike. Heather had to wait for me often, but I told her I was “the little engine that could, just slowly.” It was a good thing this little engine quit smoking a few years back, though. I don’t think a smoking engine would have made it, slowly or otherwise. It was great exercise, and it will be even better to do it more often. You can’t compare walking around the block or on a treadmill to that (though doing both rather more often in between hikes will probably be a good idea for little engines in dire need of a tuneup). Go prepared, wear the right shoes, take plenty of water and some good snacks, bring a walking stick or two, and don’t forget the sunblock. I forgot the sunblock, but I won’t make that mistake twice. We actually took sandwiches as well as some fruit and nuts, but found the fruit and nuts to be better trail food. It’s just easier to chew on an apple while walking along, especially when it’s late into the hike and you’re tired. Aside from the physical aspect, though, there are mental and emotional elements. I had been told that there were areas like this within a reasonable driving distance from home but, to be honest, I hadn’t really believed it. We took a road trip a few years ago that was a great deal of fun, but was distinctly short on trees, despite the fact that the map contained the word “forest” for part of it. I made the mistake of just assuming this would be like that, that people accustomed to the desert didn’t have the same understanding of (and possibly need of) trees as I had. I knew you could get to trees if you went far enough north, but I thought “far enough” meant “too far” and so never got excited about trying it. Thankfully Heather as smarter than I am about this kind of thing, and at least as stubborn as I am when it’s necessary. I was trying to figure out someplace we could go for our anniversary, and she said, “No, here,” so we went there. Occasionally I do what I’m told. If she’s the one doing the telling, it usually ends up being good for me. I thought at first that my assumptions were correct. The brown terrain gave way to green, but it was a green that was 100% cactus. I have never seen so many cacti in one place in my life. If you’re not desert-bred, it’s is definitely surreal to see green hills in the distance and then, when you get to them, discover that it is thousands of cacti spread out like a diminutive, prickly forest. It’s an interesting sight to see, and one that is worth experiencing if you never have, but it wasn’t the greenery I was hoping for. I was afraid, though, that it would be the greenery I got. I was wrong. I was so very wrong. The cacti fell behind us and the trees rose ahead of us. Our cabin was in the woods and an easy walk to a creek. We had dinner on an outdoor patio under the trees. I hadn’t had dinner under the trees in so long, I had forgotten how happy doing so makes me. It was fantastic. The hike goes in and out of the trees, down into a small canyon and up along the edge of the rim. 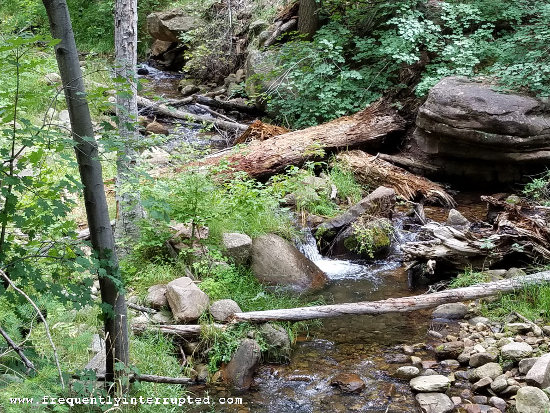 It winds back and forth along Horton Creek, sometimes crossing the creek, sometimes crossing a wash where the creek used to run, and sometimes along small cliffs overlooking the creek. The sound of running water was never far away, though occasionally that was because it was falling on us. It did rain a little and, from talking to other people we passed along the trail, we learned that we just missed some hail. It was over a hundred degrees back at the house, and we missed a hailstorm by minutes! Imagine that. I could go on, but I’ll let a few pictures explain instead. It was a revitalizing experience, and it was a lesson learned. I am often resistant to do anything that is not part of my normal routine, but I needed this change. I can’t promise that I won’t be resistant in the future, because I know me better than that, but I’ll definitely be trying to get out to the woods more often now that I’ve been convinced that they really are nearby. I would strongly suggest that you do the same. Maybe it isn’t woods that you need. Maybe it’s the lake, or the beach, or even the desert. Just get outside and go. Spend some time away from the hustle and bustle, leave the noise behind, and soak up some nature. As John Burroughs said, “I go to nature to be soothed and healed, and to have my senses put in order.” We all need that from time to time. We just don’t always remember to get it. Take the time to be soothed. Put your senses in order and be healed. Even if it’s only a day trip and you have to run right back to the work-a-day world, you’ll be glad you did it. Trust me on that.